Don’t judge these at first look! I mean, these are hard to take a photo of ok? There is something about this tot recipe that equally makes me roll my eyes a bit and also feel quite proud of myself. I am not above a convenience food for the kids - they love Banza Mac n’ Cheese and all things Dr. Praegers and we do fish sticks and avocado in tortillas for a scrappy fish taco and everyone is happy with those things. BUT! I made a homemade tot! That is exciting and I know ya’ll have been asking for me to populate the feeding babies section with more options. The tricky part with veggie burger type doughs is that eggs, or cheese or breadcrumbs hold those bits together. These have none of those things, but will also need you to treat them gingerly because of it. Be patient, expect to have funny shapes and dirty hands and I think your littles will like these. Do not forget the ketchup and ranch. A friend from Cooking Club pointed me towards this recipe and my kids are obsessed. I always have leftover rice and stock sweet potatoes so these are easy to get together. They do not have eggs, breadcrumbs or dairy, which I usually include in my veggie patties so hopefully these help some people whose kids (or selves!) are sensitive to those things. If yours are not, a sprinkle of shredded cheese in here would help them stay together. These don’t have a ton going on, so feel free to add more herbs or spice based on whom you’re feeding. In a mixing bowl, combine the grains, sweet potato, flaxmeal, salt, brown rice flour, dollop of sauce if using and a small handful of fresh chopped parsley. Stir to combine. Pop the bowl in the fridge for 10-15 minutes to chill and firm up. Heat a generous few tablespoons of oil in your pan (non-stick or seasoned cast iron suggested). Put a bit more brown rice flour in a shallow bowl. Form the sweet potato mixture into tot shapes and roll them in the flour. Your hands will get messy, just rinse between. Add them to the hot oil and continue with the remaining dough. Toast the tots on all sides, shaking the pan around, and remove them to a plate to cool. Serve the tots with ketchup or ranch. They can be frozen and reheated in the oven at 400’ as needed. A simple and healthy home made tater tot. Heat a generous few tablespoons of oil in your pan (non-stick or seasoned cast iron suggested). Put a bit more brown rice flour in a shallow bowl. Form the sweet potato mixture into tot shapes and roll them in the flour. Your hands will get mess, just rinse between. Add them to the hot oil and continue with the remaining dough. Toast the tots on all sides and remove them to a plate to cool. I can’t do strict diets. They inspire an otherwise absent rebellious streak in me and I go headlong into a sugar spiral. I remember trying the master cleanse many years ago, fully stocked on all the maple, lemon and cayenne I could stand and I lasted until lunch on the first day. I really like eating. It is much more sustainable for me to find some healthy moderation, because if I set out to not eat ANY sugar, or swear off bread, all I can think about is chocolate and toast. Healthier habits have come from over a decade of caring about wellness, and figuring out what that means to me. I have learned some things by following Kelly Leveque/@bewellbykelly, and while I don’t follow her program (it isn’t realistic with how often I work around food and the variety it requires of me), she’s helped me rethink my meals to curb hunger. I am not afraid of fat, I’m trying harder to incorporate a portion of protein into my meals, and remain mindful of carb intake. I am notorious for giant salads, with no protein, then you would find me halfway through a pint of ice cream one hour later because I was not satisfied. Nuts, avocado, eggs, healthy oils… all of these things help a salad stick. I recently learned I am highly allergic to casein (dairy) and am at the beginning of the road with some auto immune issues, so I am just trying to keep things generally less inflammatory. I keep canned salmon and tuna in the pantry, hard boil half my carton of eggs, or make a lentil salad that has lots of crispy vegetables in it so it will keep in the fridge. I love a good entree salad so much but some garden plate with cucumbers, tomatoes and lettuce does not qualify as dinner. I don’t have the credentials to speak as an authority on nutrition, but I love learning about it and trying new things to feel good. At first glance, this salad may look a little complicated, but I promise all the steps layer on each other and it is the most delicious salad I’ve made in a long time. While the cauli roasts, you make your dressing and crispy quinoa. It makes sense to double up so you can recreate this for lunch the next day. Add chicken or salmon if you are looking for an obvious protein, or don’t, and it works for all the vegan, veg, gluten and dairy free people. I do miss my favorite feta, so add that if you have some. I divided it by component below, so you can make some things in advance if that helps. For nearly every part of the salad, I used the Rich and Robust Olive Oil from the Destination Series by California Olive Ranch. You can see more in my last post here. I used it to roast the cauli, make the green harissa, crisp the quinoa, and smooth out the dressing. It has a grassy, forward flavor, that I really like in salads. California Olive Ranch has partnered with olive growers in other countries for these delicious blends, keeping with the same quality standards you can always expect from the brand. 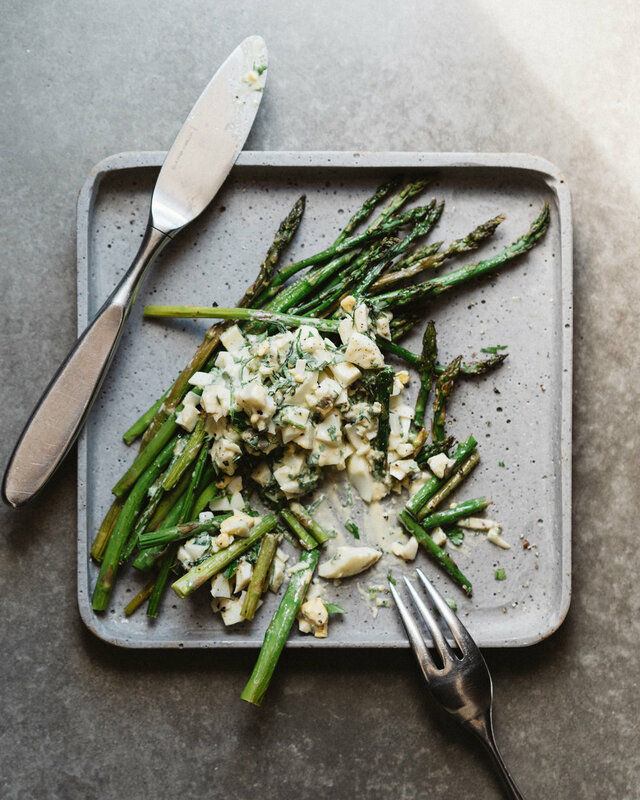 I am linking to a green harissa recipe we have here on the site, or also giving you full permission to use the amazing zhoug sauce from Trader Joes if you need to save a step. Both are amazing here or on eggs or smashed with some avocado for a taco or sandwich. You get the idea. It, as well as the quick dressing, can be made in advance to save you time. 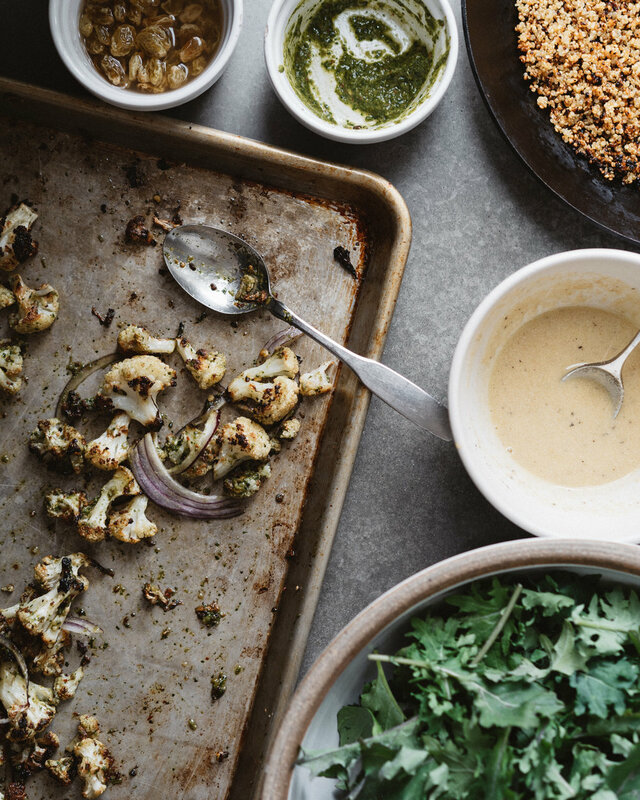 Preheat the oven to 400’, spread the cauli florets on a rimmed baking sheet, drizzle with the oil, salt and pepper and toss everything to coat. 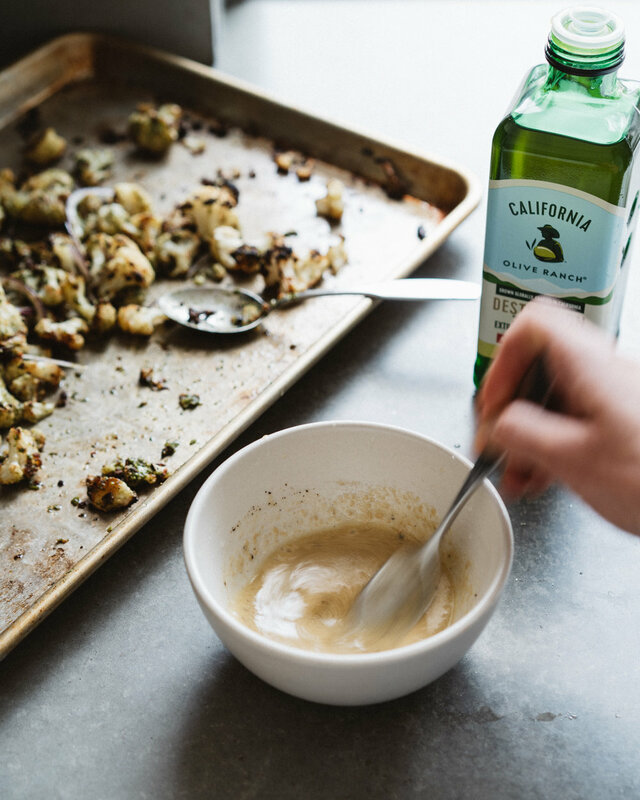 Rub the oil into the cauli with your hands to make sure everything gets a thin coat. Roast in the upper third of the oven for 25 minutes, stirring halfway through, until well browned. Make the green harissa if you’re making it from scratch, or have your zhoug ready. When the cauliflower is out of the oven, toss it with the red onion and about 3 Tbsp. of the green sauce. Set aside to cool. 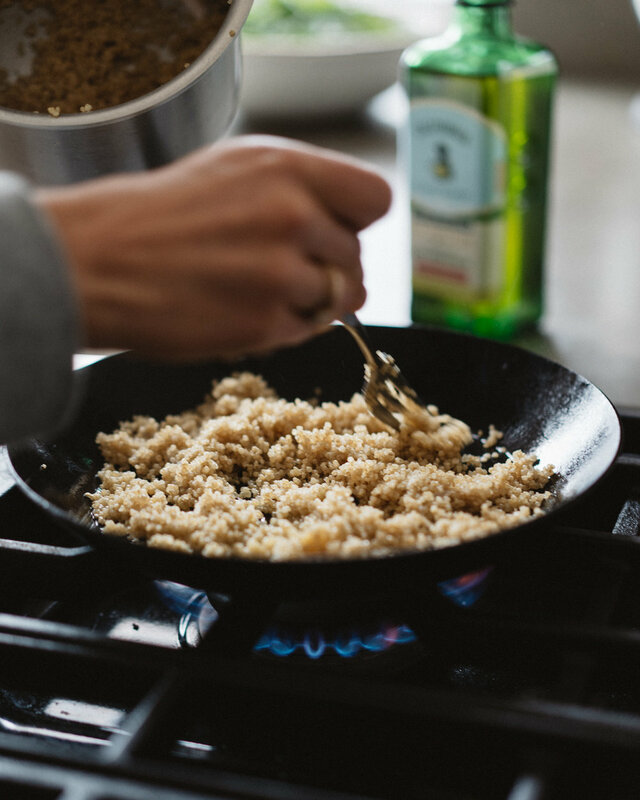 For the quinoa, heat the oil in a pan over medium heat. Add the dry and cooled quinoa to the pan, give it one stir, then leave it undisturbed for 3 minutes so it browns. Give it one more stir, let it brown for 5 minutes. Continue to do this every 5 minutes until the quinoa looks browned and crispy. Should take about 15 minutes. Let it cool. 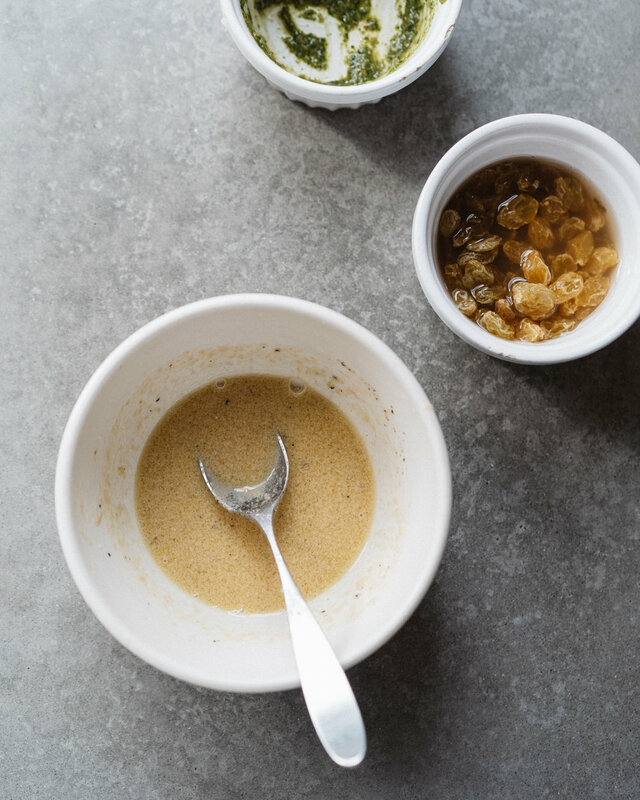 Stir the dressing ingredients together - the tahini, lemon juice, olive oil, with a pinch of salt and pepper. Collect you kale in a large salad bowl. Drizzle on desired amount of dressing and toss to coat. Add the raisins and half the pistachios, toss again. Serve your bowls of salad with a heaping pile of the cauli, some crispy quinoa, avocados and garnish with remaining pistachios. You could add a little feta or lentils or whatever protein you’d like! This post is sponsored by California Olive Ranch. All recipes and writing are my own. 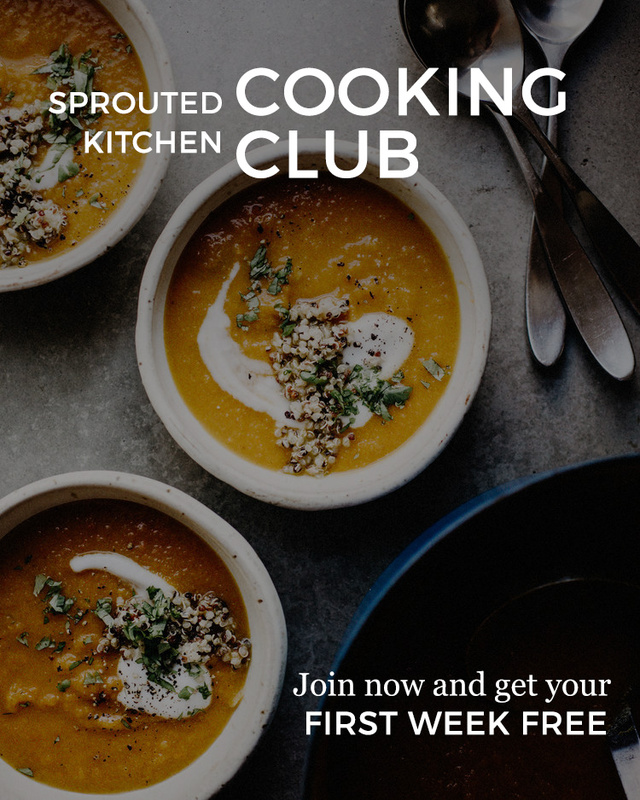 Thank you for supporting brands I work with, so that I may continue to create recipes here! A hearty salad with layers of flavor and texture.